Wild Woods is the third race course of the Crossing Cup in Mario Kart 8 and Mario Kart 8 Deluxe. The course can be obtained in Mario Kart 8 by purchasing the Animal Crossing × Mario Kart 8 downloadable content along with the other three race courses found in this cup. The course is located in a forested area inhabited by Toads and Shy Guys, where the track runs around a giant tree, its branches, down a stream passage and through a pond in a clearing of the forest. The race starts in a grove, serving as track on the trunk of the tree, therefore racers start the course in anti-gravity mode. 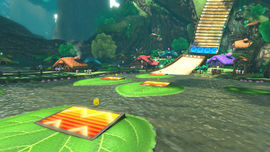 The track makes a U-turn to the right while racers meet the first set of Item Boxes and coins and follow a boardwalk. The track then splits in two, while the boardwalk ends with two ramps for tricks on each side. Racers can choose which branch take: The left has some coins scattered in the road, while the right has more ramps for tricks but no coins to collect. After that, the two sections join and finish with another ramp to jump, where the anti-gravity mode turns off and racers once again land on a boardwalk that runs through a small village dwelling in the top of tree, inhabited by several Shy Guys. The track bends gently to the right with a second set of item boxes here and some coins. Racers now take the blue ramp to glide over a large void and reach a circular platform at the end with a picture of Shy Guy's mask on it. The boardwalk continues once racers have landed there. Taking a slight bend to the left, racers drop from the boardwalk to a passage with a stream of water running down, giving them a slight boost of speed. Racers will find here more ramps to jump and coins moving along the stream, and the last set of item boxes, while the passage turns to the right. Racers exit the passage taking the last ramp and fall to a shallow pond in the lowest level of the forest. 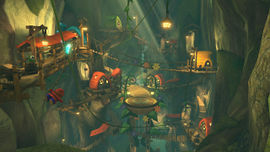 The pond has enormous leaves floating with Dash Panels on them, so that players can run over and perform their tricks. The last set of coins is found there over the pads. After the pond, the racer will find a last ramp to jump over another gap and land directly another boardwalk over an anti-gravity pad. The track makes a slight detour to the left, which is also the last bend that leads the player back to the trunk's groove and starting line, completing in that way a lap. A mushroom can be used over a patch of grass cutting off a corner. To the left of the jump ramp a small grass ramp can be taken using a mushroom cutting off the turn leading to the main ramp. Just before the finish line and located in the detour, there is a single jump ramp that can be taken. It is required to use a Mushroom or a Super Star to take this way due to the grass before it. The staff ghost for this track is a Villager driving the Streetle. The time is 2:04.480. Male Villager, performing a mid-air trick. Male Villager, at the track's glider portion. Dry Bowser, at the pond portion of the track. Like on Wii Wario's Gold Mine and Shy Guy Falls, the Shy Guys on the glider segment chant as the racers pass by. This is the only track to start in anti-gravity, but not to be in anti-gravity for the whole race. This is the only track in the Mario Kart series to have music in 5/4 time; that is, five beats to a measure and the quarter note gets the count. This is the only new track in Mario Kart 8 in which its icon has the feature on the left side of the icon. This page was last edited on June 19, 2018, at 06:43.